The walk from Nafplion to Arvanitia Beach. 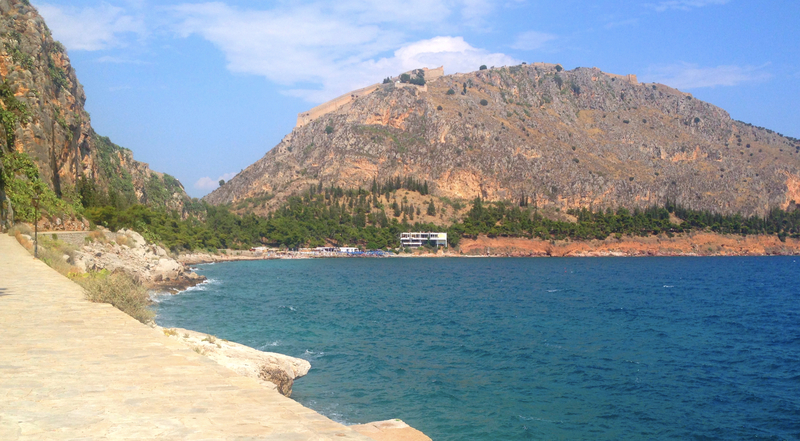 That structure slinking up the mountain is Palamidi Fortress, which the rest of them were climbing while I was paddling in the azure waters. Smart choice on my part, huh? 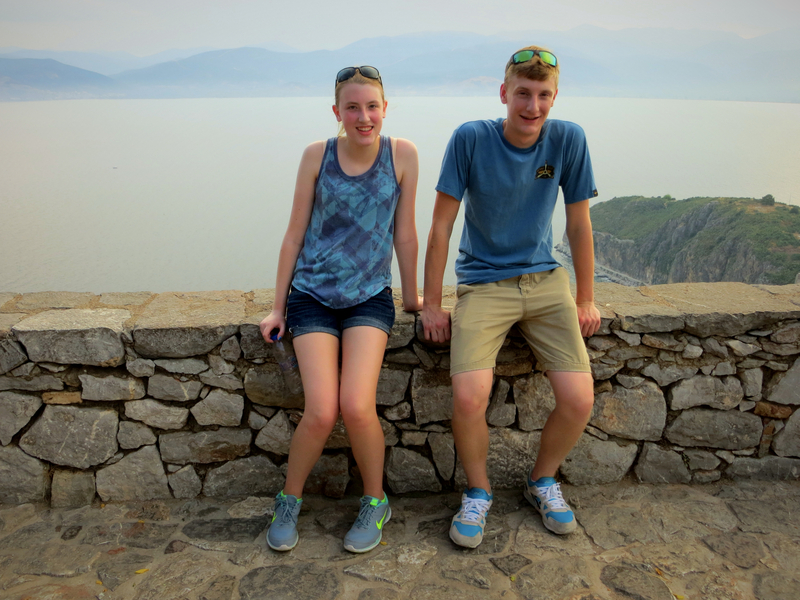 From Delphi we drove south to Nafplion, what will be our only stop on the Peloponnese Peninsula. 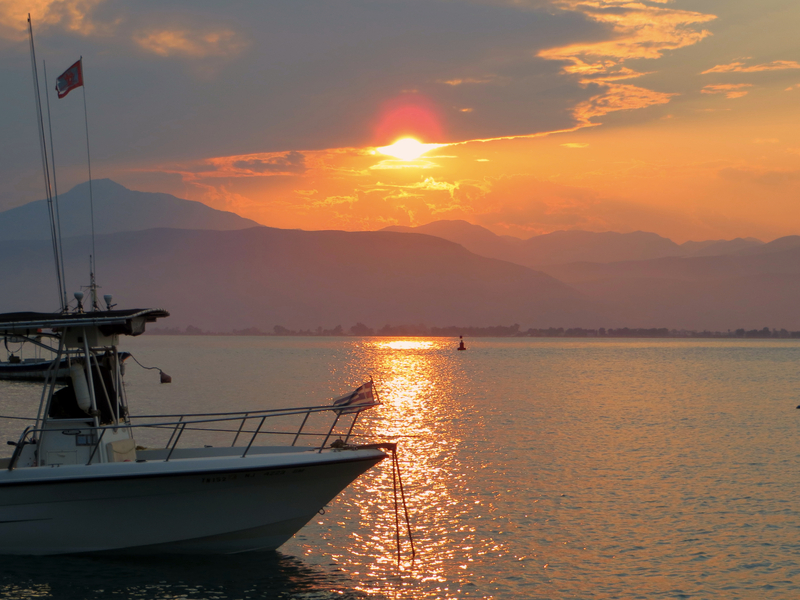 Nafplion has been a major Aegean port since the Bronze Age and was occupied by the Venetians and Ottomans each for a few hundred years. More recently it was the original capital of Greece during and immediately after the war of independence (from the Ottoman empire) in the 1830s. Today, with its elegant Venetian mansions, narrow streets, cute cafés, sidewalk restaurants, and of course that incomparable Mediterranean Sea, it’s a tourist mecca. 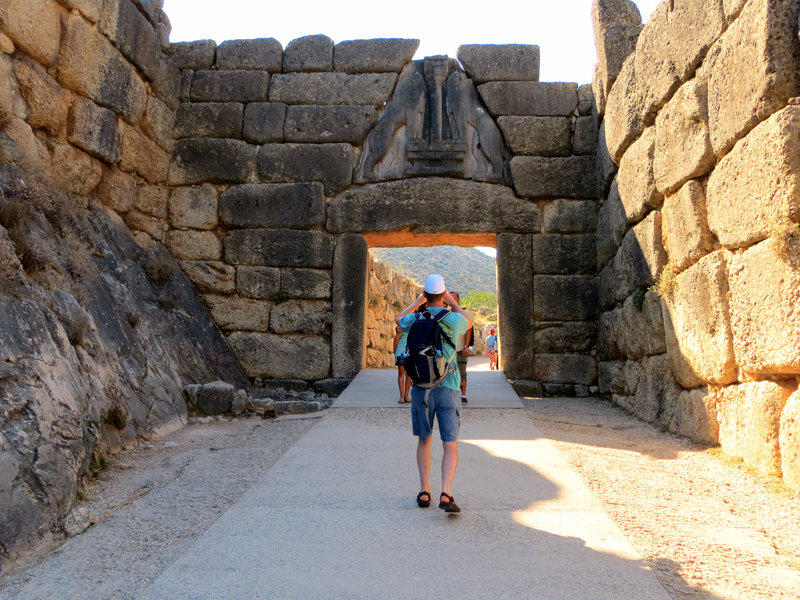 Dan, photographing the Lion Gate at Mycenae, the main entrance to the citadel. It dates from the 16th century BC and is the only monumental Mycenaean sculpture still in existence. Amazingly, it appears to have stood there over the millennia, unlike most ancient ruins that had collapsed and only in recent times been rebuilt. 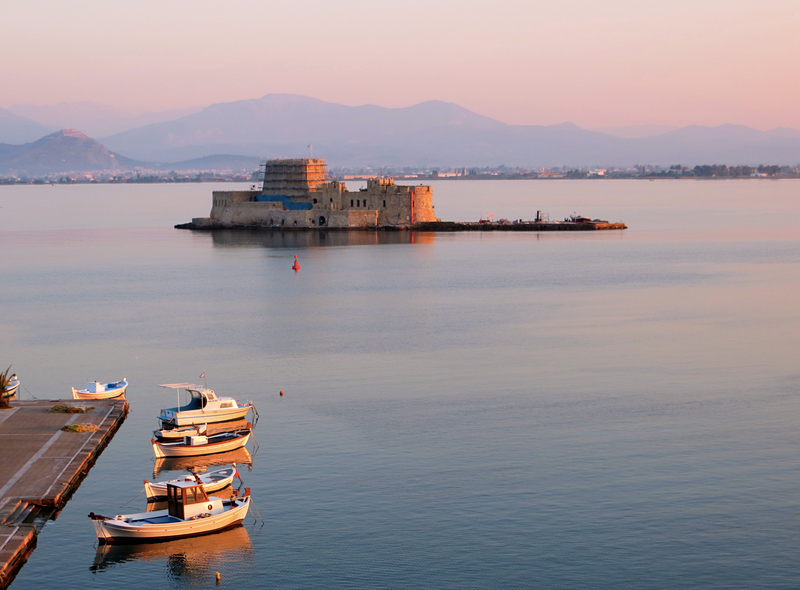 While enjoying the modern joys of Nafplion, you’re never far from history of course, this being Greece and all. A key adventure, then, was do drive north to Mycenae, home to the ancient Mycenaeans who were the most powerful Greeks during much of the second millennium BC; the period of Greek history from about 1600 BC to 1100 BC, in fact, is known as the Mycenaean era. And to put it in its Homeric context, Agamemnon, the leader of Greek forces in the Trojan War, was king of Mycenae when he took to the seas to rescue Helen, whom Paris of Troy had abducted. (You can read the Iliad for more details.) While I stayed home to deal with some health insurance issues Mark & the many Germains made the day trip. 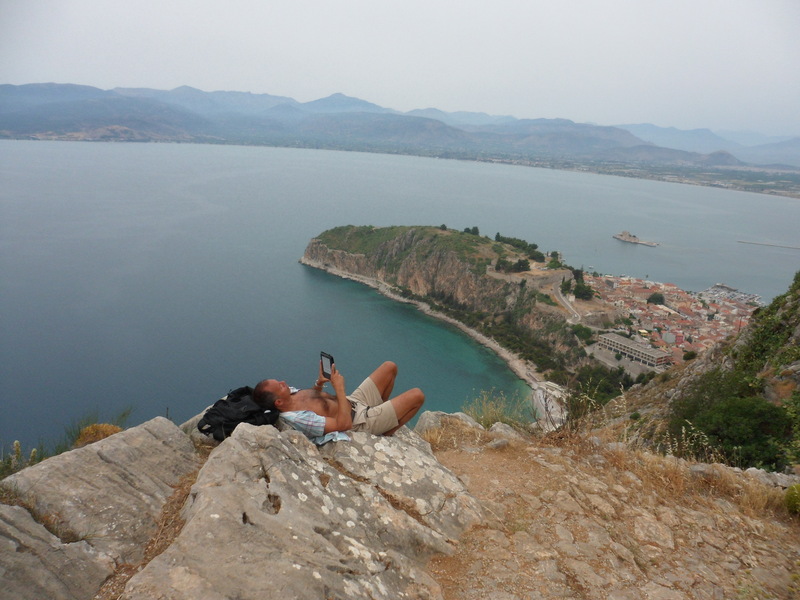 Another little jaunt worth doing in Nafplion is to climb the Palamidi Fortress, built by the Venetians on a huge outcrop in the early 18th century, during their second occupation. Once again I let Mark and the Germains do the heavy lifting; I’d been up there three years earlier when Mark & I had passed through Nafplion and had the sense that I would use my time more effectively lying on a beach somewhere. Turns out I was right. There’s just no way you can describe the perfection of a swim in the Mediterranean in July. So after I raved about how fabulous it was, we all went back the next day, after their Mycenaean sojourn, for an afternoon at the beach. Heaven. 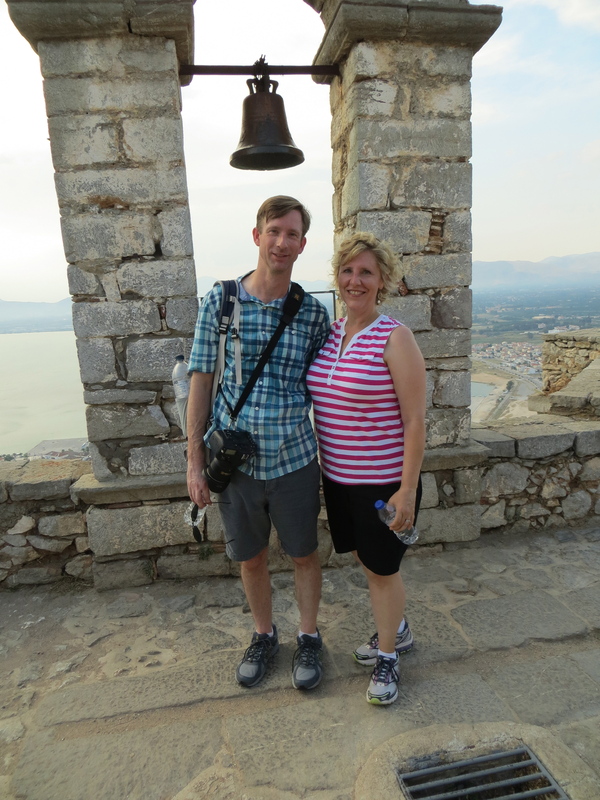 Nafplion was a short stop for us – two nights and then back to the Athens airport for a flight to Crete. As the site of our first Mediterranean swim, though, it was a nice little detour. Now on to see why those Cretans have such a bad reputation. And while I’m posting old pictures, Mark was showing us some pictures from his 1984 trip to Europe when Dan noticed that this was the back of Lion’s Gate. 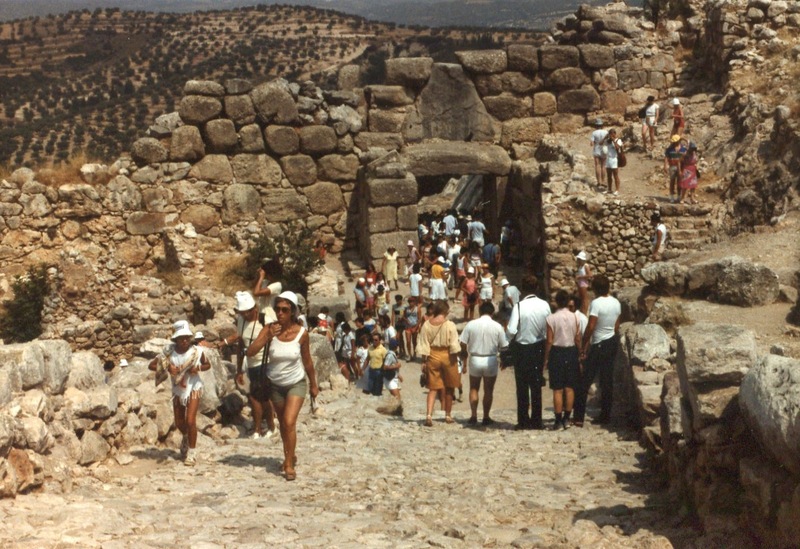 You see, Mark didn’t know he’d been to Mycenae previously; it was only when faced with photographic evidence that he concluded he apparently had been there 31 years earlier. In the brutal afternoon heat while touring the temple of Apollo, I found a tall, thin Cypress tree offering shade. Soon the Germain family was lined up behind me, all enjoying the comparative coolness offered by the tree. So now I introduce, from front to back, the Germains – Laura, Elizabeth, Dan, and Charlie. Yeah, there’ll be lots of stories of history and art and myths and Gods and all that. 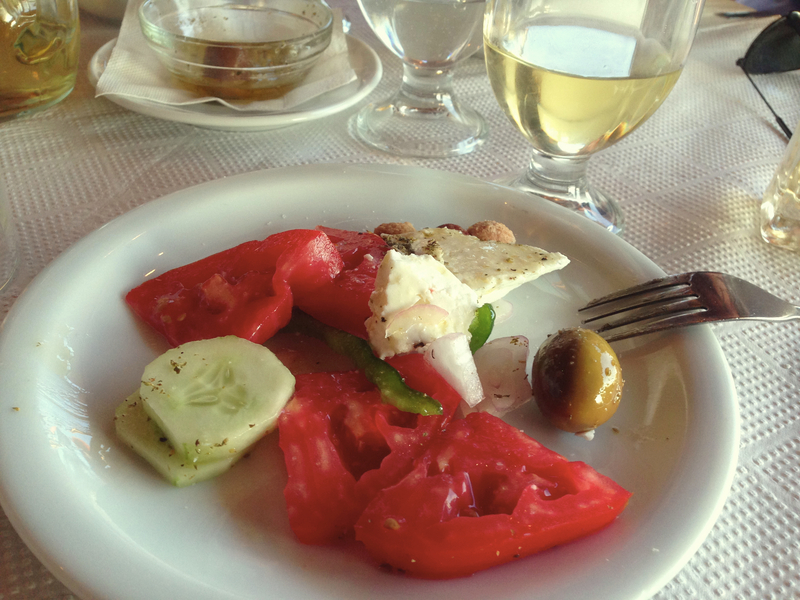 Meanwhile, here’s what we really came to Greece for: our first Greek salad. 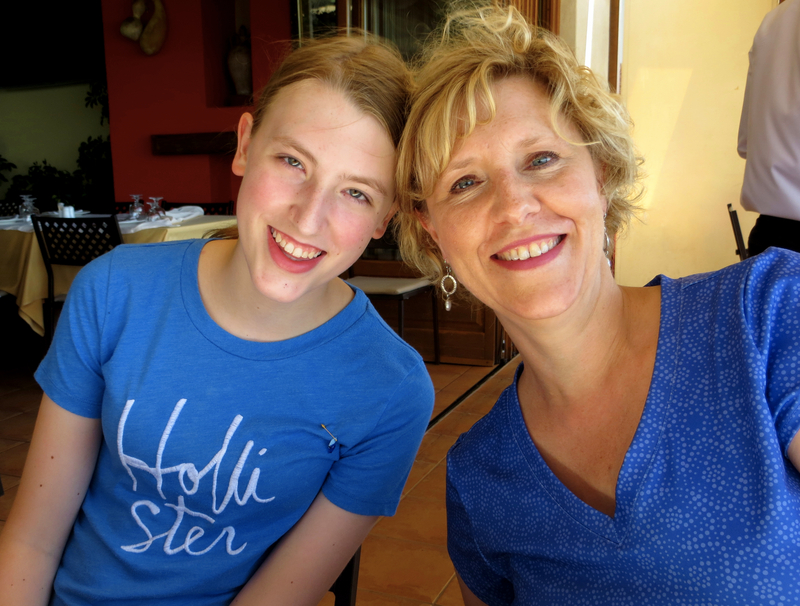 Here it is now, summer of 2015, and the six of us are in Greece for two weeks. Due to the challenges of traveling at high season with six people, these two weeks are more far planned than most two-week periods in the last two years. 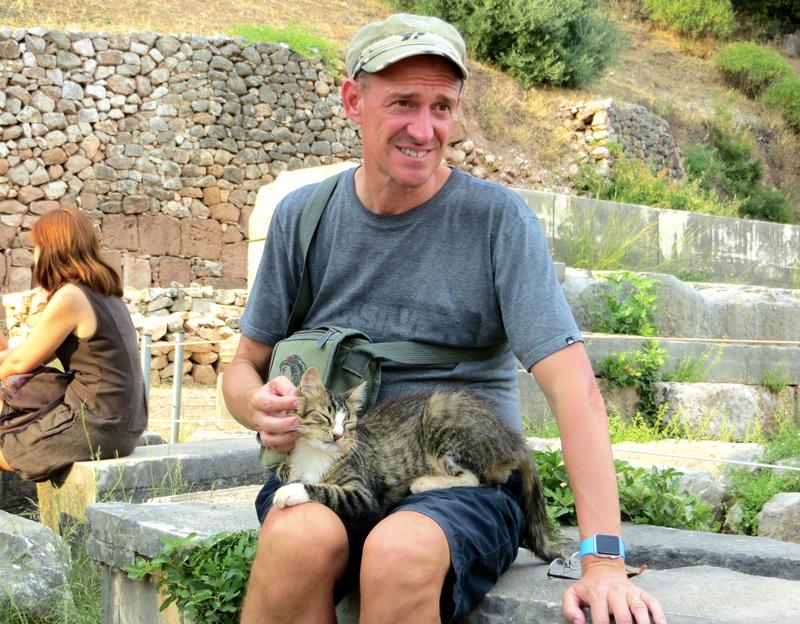 Two days in Delphi, two in Nafplion, four in Crete, three in Santorini, and three in Athens. 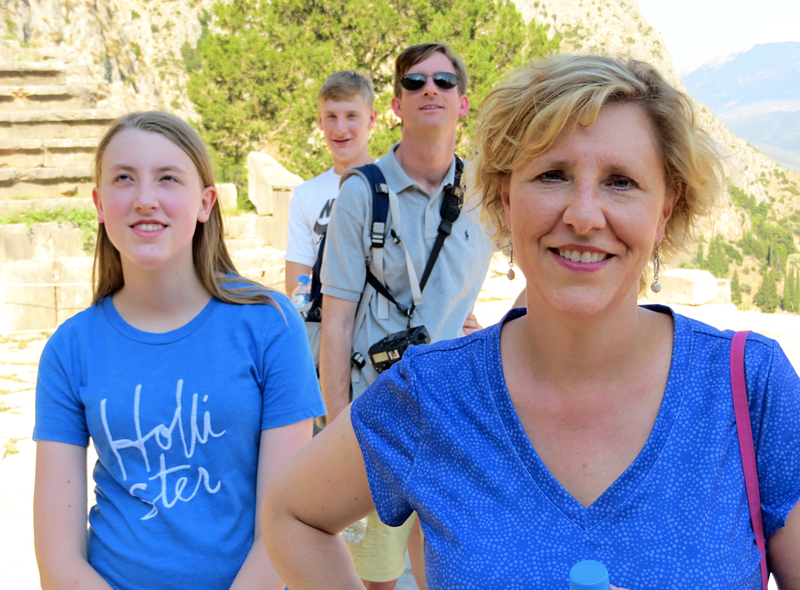 We’re starting our Greek adventure on the slopes of Mount Parnassus in hot, dusty, dry Delphi. 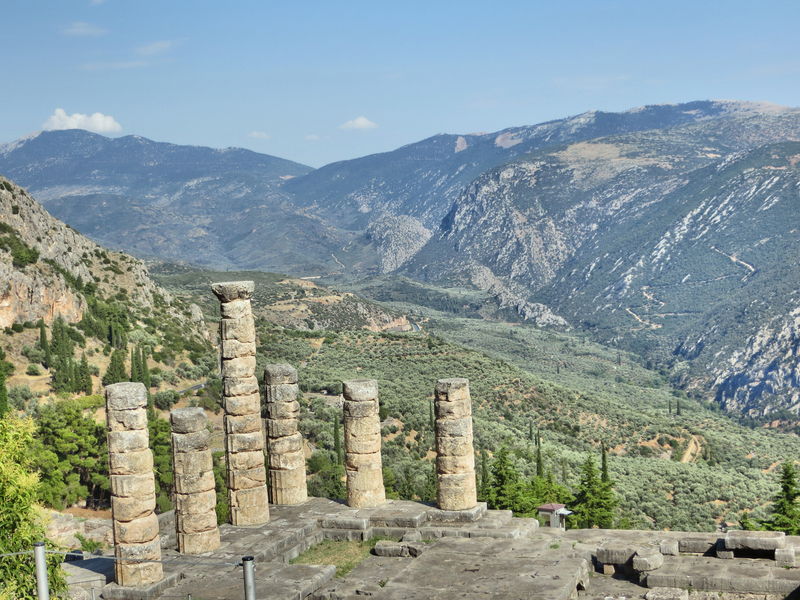 For centuries, Delphi was the religious and spiritual center of the ancient Greek world. Though Greece then consisted of a large number of independent city-states, often highly competitive or even at war with each other, Apollo’s sanctuary here was considered sacred and thus protected by and accessible to all Greeks. It was, in fact, considered the center of the universe, the omphalos or navel of the world. Every four years the site also hosted the Pythian games, second only to the contests at Olympus in terms of prestige. Unlike the Olympian games, though, the Pythian games also included the mousikos agon or musical contests as well. The remaining pieces of Apollo’s Temple, with a spectacular view over the Phocis Valley. 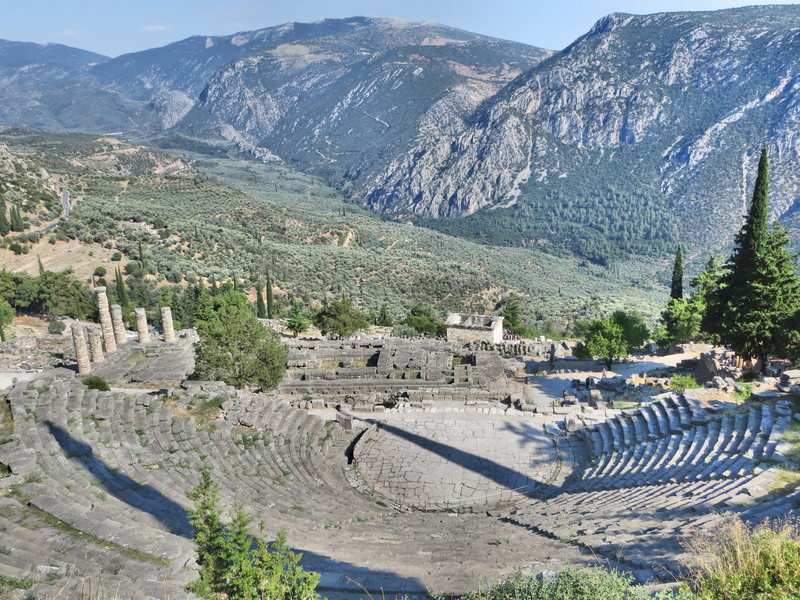 Of central importance to the sanctuary of Apollo here was the Oracle of Delphi, a priestess who offered prophecies based on her communication with Apollo. Selected at the death of a current priestess, she was available to answer questions from as relatively trivial as to if or when a couple should marry to whether a Greek state should go to war. It was said that the Oracle would go into a trance – thought by many, including the historian Plutarch, to have been caused by vapors escaping through the center of the universe. Her answers were often notoriously ambiguous. The stadium, where the Pythian games took place. The seating was added by Emperor Hadrian – a noted Hellenophile – in the first century AD; before then, fans just stood or sat on the ground. Today, the stadium is roped off; you can see it but you can’t go into it. 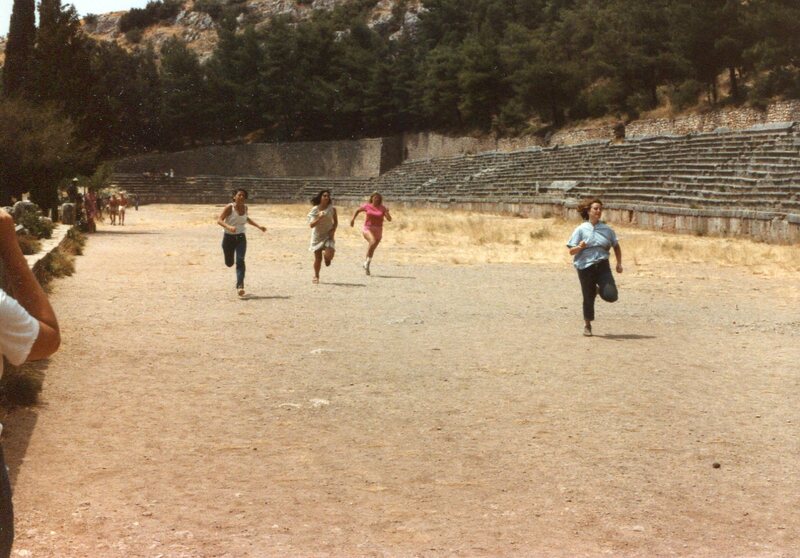 When Mark was here in 1984, though, it was wide open and so some of the girls he was traveling with sponsored their own version of the Pythian games. He had all the fun! My favorite story about the Oracle of Delphi is from the legendary Croesus, king of the Ionian state of Lydia and thought by the Greeks at least to be the world’s richest man. He was preparing to attack the far more powerful kingdom of Persia and went to the Oracle to ask for advice. She responded that if he attacked the Persians he would destroy a great kingdom. Of course, he forgot to ask which kingdom would be destroyed and lost everything when Cyrus the Great of Persia wiped out his army. 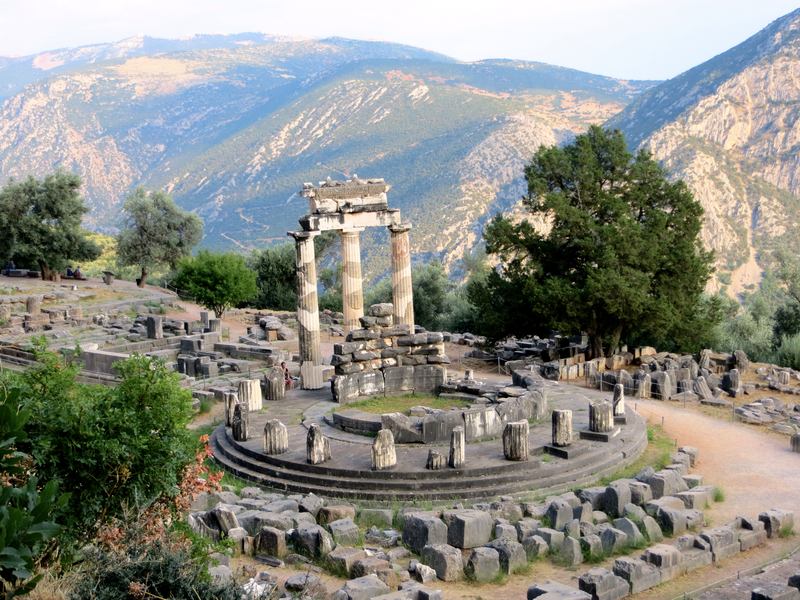 Delphi was a great start to the Greek expedition, a nice little jolt of ancient history in a cute town with fantastic views over the valley and classic Greek food. 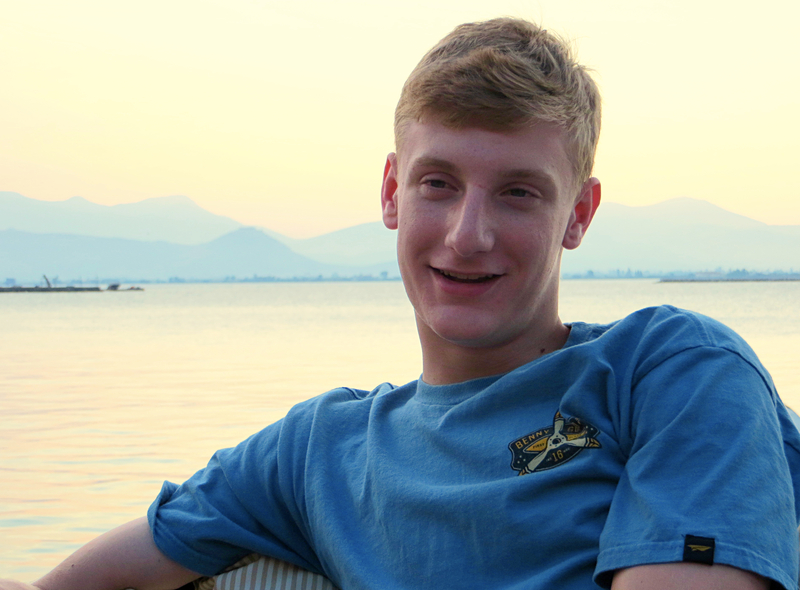 Next we move south for a couple days on the Peloponnese Peninsula. The grand amphitheater, looking over the temple of Apollo and the whole valley. 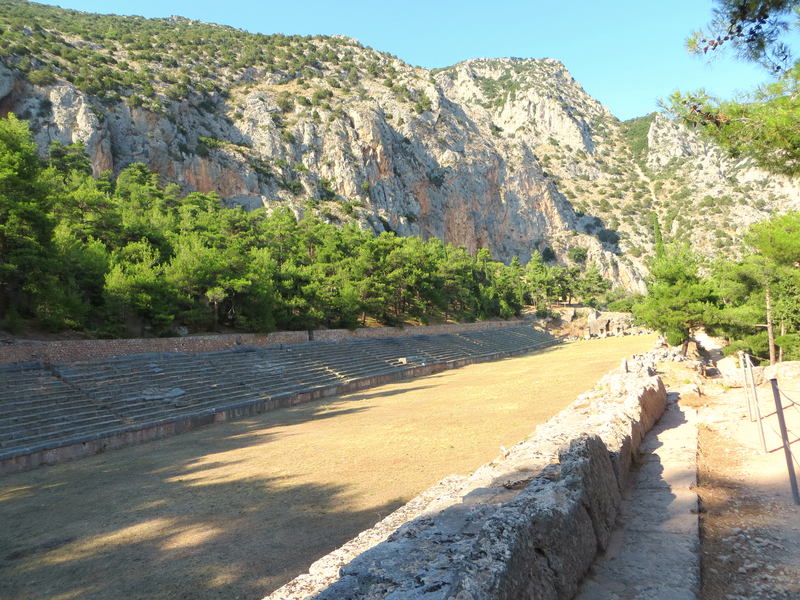 This is where the musical competitions during the Pythian games took place. And here are Mark & Laura testing the acoustics at the theater, lustily belting out Mama Mia! Adjacent to the ruins is a pretty good museum with lots of old stuff. 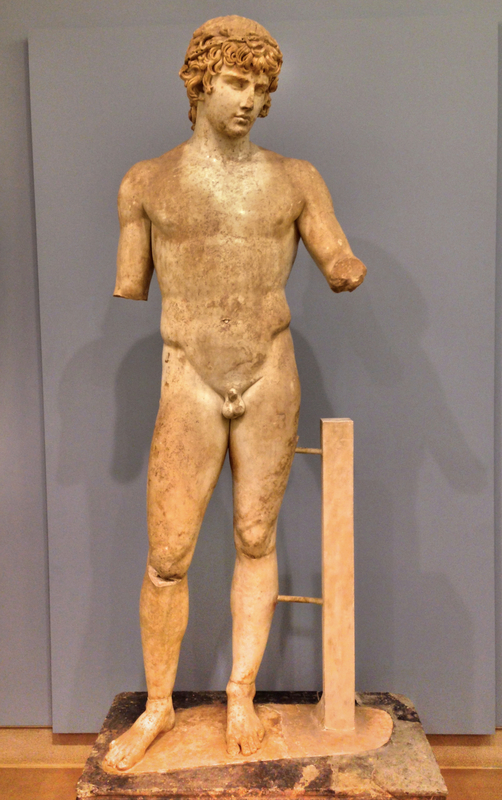 This is a statue of Antinuos, a youth of “extraordinary beauty” who was 2nd century AD Roman Emperor Hadrian’s beloved companion or, as we would call him today, the Emperor’s boy toy. When he drowned in the Nile river – thought by some to be at Hadrian’s order as a human sacrifice – Hadrian ordered statues of him to be erected across the empire and had him deified in the east where that was considered acceptable. This statue, found in remarkably good condition here at Delphi, is one of the most complete. 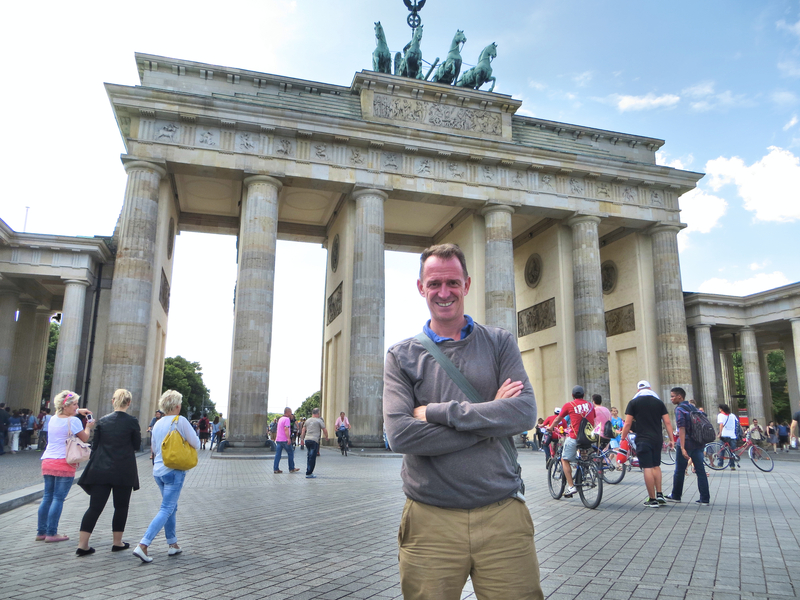 The Brandenburg Gate viewed from the West Berlin side during Mark’s visit here in 1984. 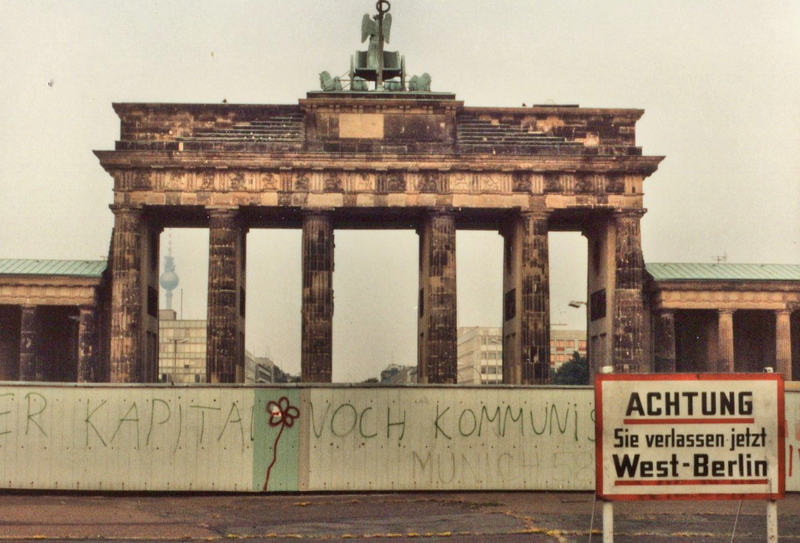 It was in the no-man’s land along the Berlin Wall and thus utterly abandoned. Berlin. The Cold War. Museums. Nefertiti. Four days was no where near enough; we will definitely need to go back for more time. For me there were three highlights: spectacular museums; great neighborhoods, bars, & restaurants; and the unique situation of having been two cities in separate countries at the center of the Cold War less than 30 years ago. Altogether it was quite the package. 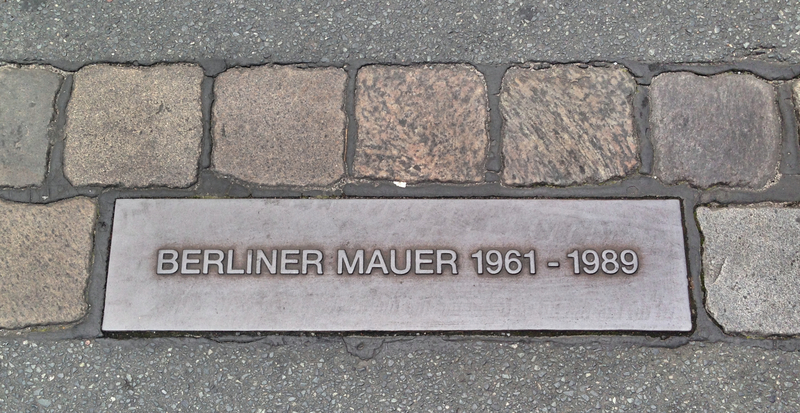 You’re walking around and just kind of randomly see something like this, memorializing the Berlin Wall. In retrospect, given how prominent it was and how permanent it seemed, it’s surprising to be reminded that the wall stood for only 28 years. The museums are really the main attraction. 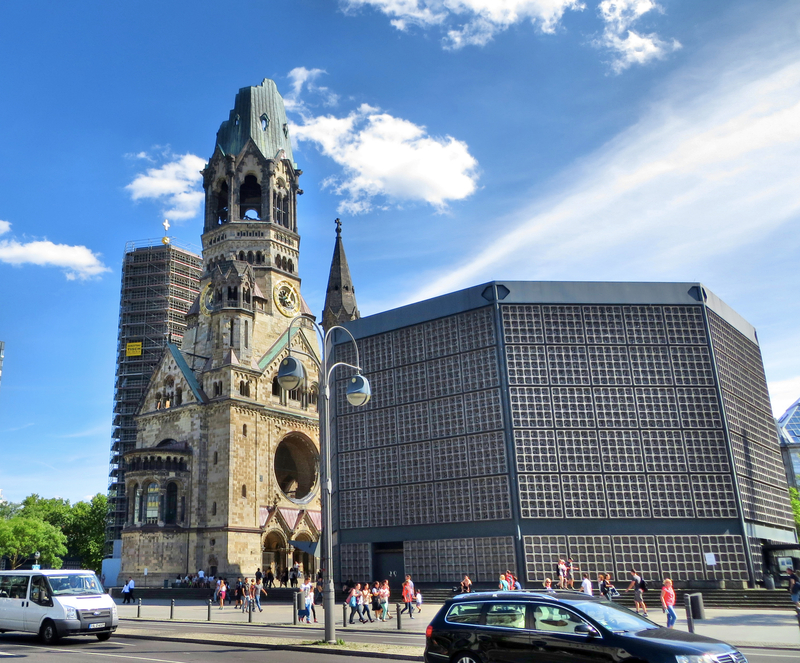 Berlin is the home, Wikipedia tells us, of 138 museums. For $24 Euros – under $27 today – you can get a three-day pass that lets you in to maybe 50 of them. Of course, you can’t really tour 50 museums in three days so you have to be selective. That’s facilitated by the decision made many decades ago to put five of them, five world-class museums, on one tiny island (conveniently called Museum Island) near the center of the city. Today, the five museums collectively are a UNESCO World Heritage Site, as well-deserved as any UNESCO site could be. In our all-to-brief four-day stay we made it through four of them, but the lines at the Old National Gallery with it’s collection of 19th century masterpieces were just too long. We’ll go back, and next time we’ll reserve a time slot weeks in advance. 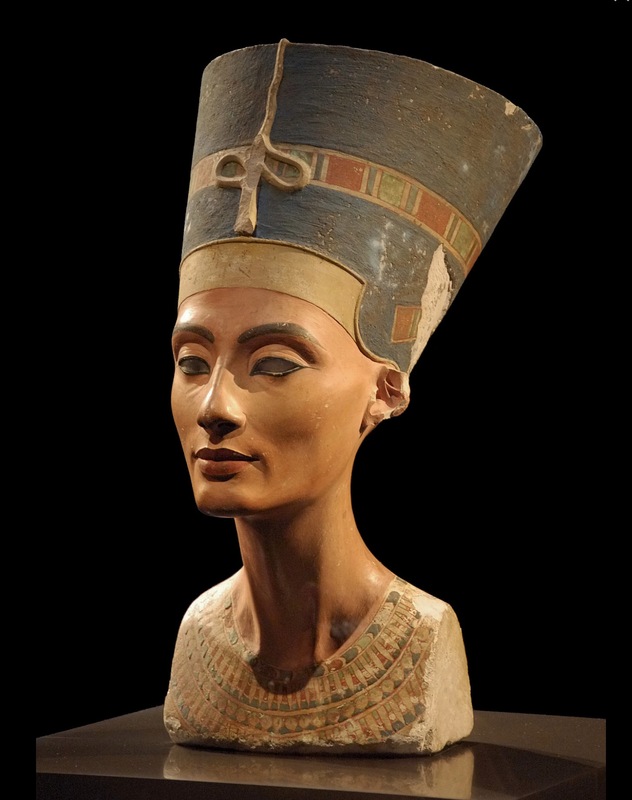 A professional photo of the stunning Nefertiti, the most beautiful 3,300-year-old woman ever. Amusingly, the museum that I enjoyed the least was also the one that I enjoyed the most. The New Museum was built in the mid-19th century and heavily damaged a century later in World War II. The ruins were left to decay for decades until in 1986 the East German government started to make plans to rebuild the museum, but then after reunification the plans were put on ice again. Finally in 1997 rebuilding got underway and the new New Museum was reopened in 2009 at a cost of some $400 million housing the Egyptian and Prehistory and Early History exhibits. Since then the museum gets great accolades for the architecture and the way they incorporated pieces – literally, individual bricks and so on – into the new building. The problem for me was that for the most part I didn’t think it did a decent job at all of telling a story of Egyptian history. To be fair, my knowledge of Egyptian history is pretty weak, so to work for me the exhibit would have had to have been pretty basic. Instead it was all just a jumble of stuff, with no flow from one room and one era to the next. Descriptions of various pieces on display would talk about how it fit into the architecture of the museum and who funded its purchase and so on, things that just didn’t seem that important to me. 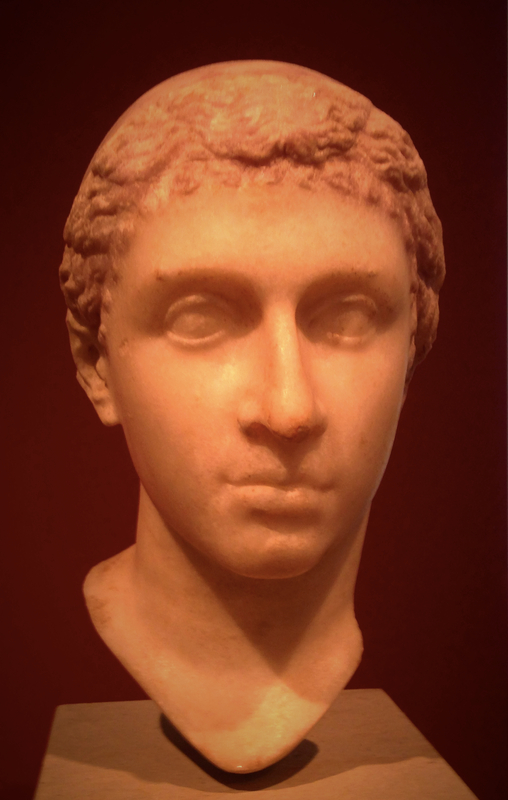 A bust of Cleopatra. She captured Julius Caesar’s heart, (probably) bore his only son, and later coupled off with Mark Antony who ended up losing the big civil war to the guy we now know as Augustus. I had read a few years ago that she was powerful and alluring, but not necessarily classically beautiful. I mean, compare this to Nefertiti! But – and it’s a huge but – the museum included one room that had the iconic bust of Nefertiti dating to 1345 BC. Over the years we’ve seen a lot of great art, a lot of old masterpieces, but this one took my breath away. The colors, the shape of her face and neck, the intensity; the history of her unusual status of ruling with her husband. It all looked so real, so current, even modern. And just so beautiful. Stunning, really. I didn’t really like the museum, but that one piece made up for a lot. We enjoyed the other three museums on Museums we made it through enormously. 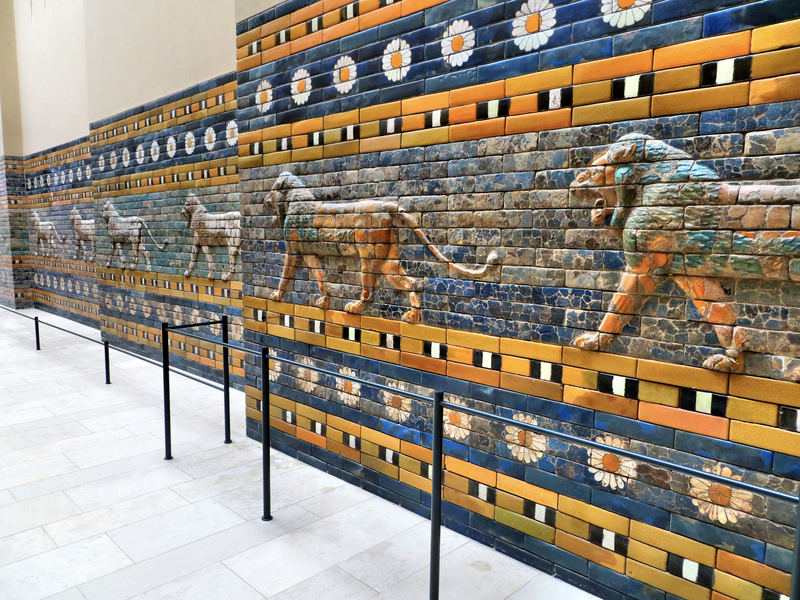 The Pergamon Museum houses original-sized, reconstructed monumental buildings, and was built originally to display the Pergamon Altar, a massive structure built in modern-day Turkey in the second century BC. 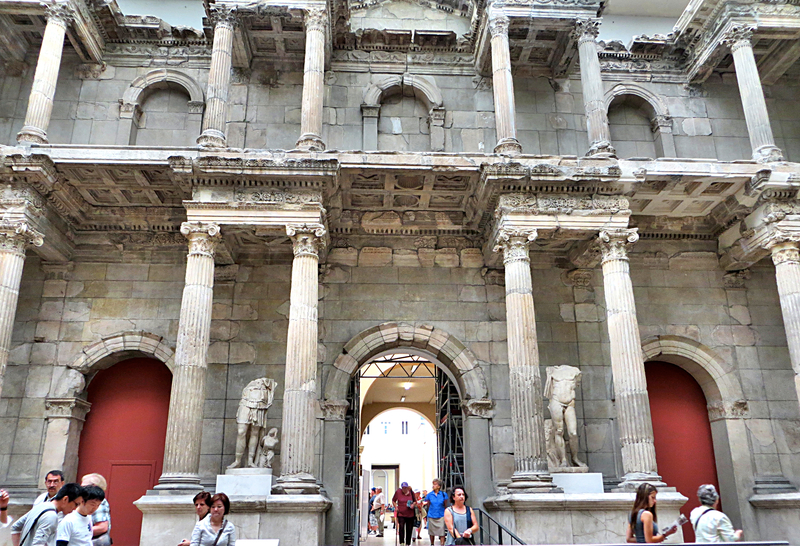 Unfortunately, last year the authorities decided it was time to renovate the Altar and redesign the space where it is displayed so there is a sign outside noting that the Pergamon Altar will be closed to the public until 2020! 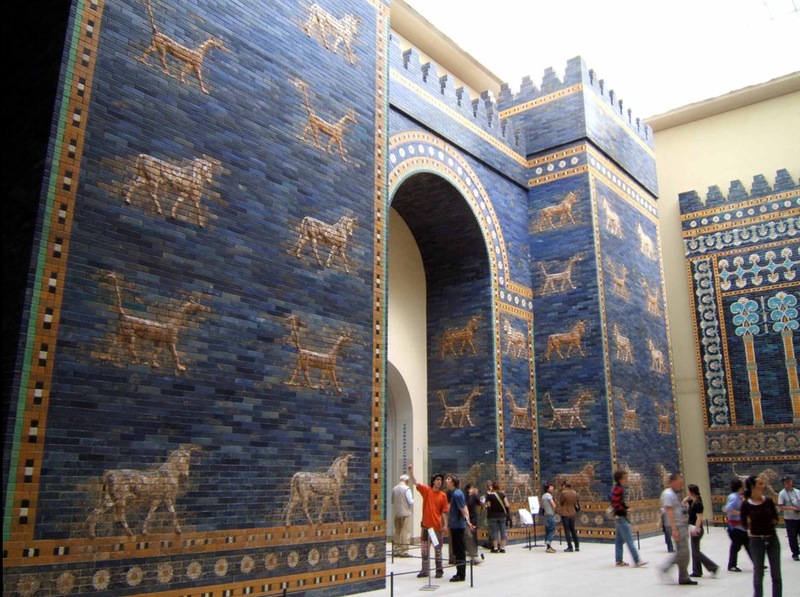 Still, there were some pretty spectacular pieces still there, including the gate of Ishtar and a piece of the processional entrance from Babylon, and the Islamic Art exhibit. And then there were lots of other great things to see. The Old Museum – the first to be built on the island – houses a great Greek collection on the first floor with Romans up on the second. It seemed a little strange to be touring the Greek antiquities just days before flying to Greece, but it was a pretty good introduction. A second-century Roman sarcophagus telling the story of Medea. Part of what I loved about this museum was that the descriptions were really helpful, showing how each character there is doing something to demonstrate a particular part of the story. I could go on, but you get the point. We never made it into the Reichstag, where apparently you should reserve a time weeks in advance. 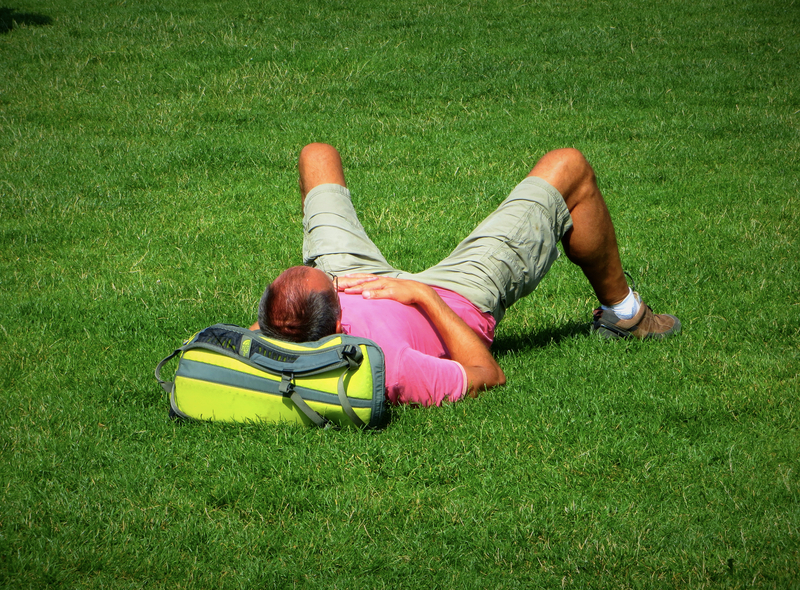 We stayed just a few blocks from the Brandenburg Gate and from there could walk into the peaceful 500-acre Tiergarten, where several lovely afternoon hours were spent reading. Just walking around the city you would notice little plaques showing where the Berlin Wall had stood, and you could observe that parts of the formerly Eastern quarter was still just a little grittier, a little less happy, than over to the west. Which, of course, also made them more interesting. So that was it. 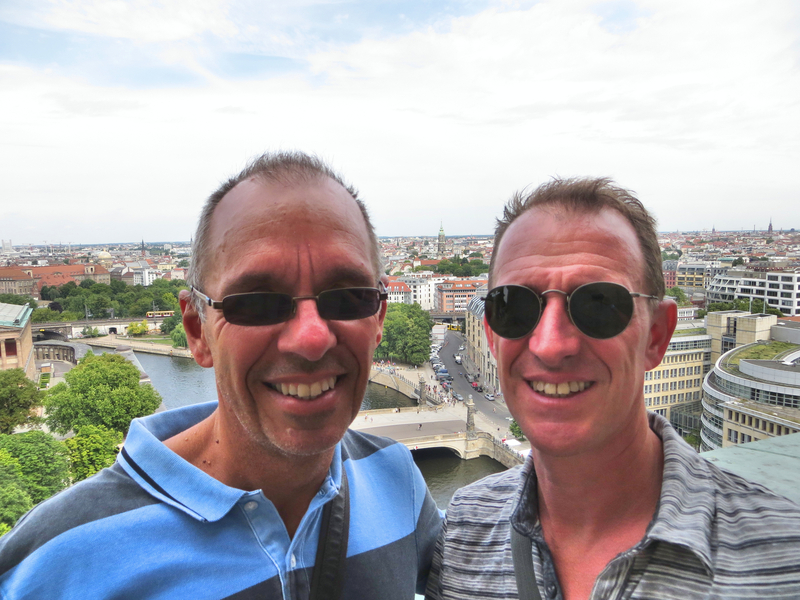 We loved Berlin and will most certainly going back in a year or two for a more extended stay. We toured the Berliner Cathedral and then I decided to relax in the amusingly named Lust Garden in front and “read.” Mark took this on his way back to the hotel, noting that I hadn’t even made the pretense of getting out my book before falling asleep. 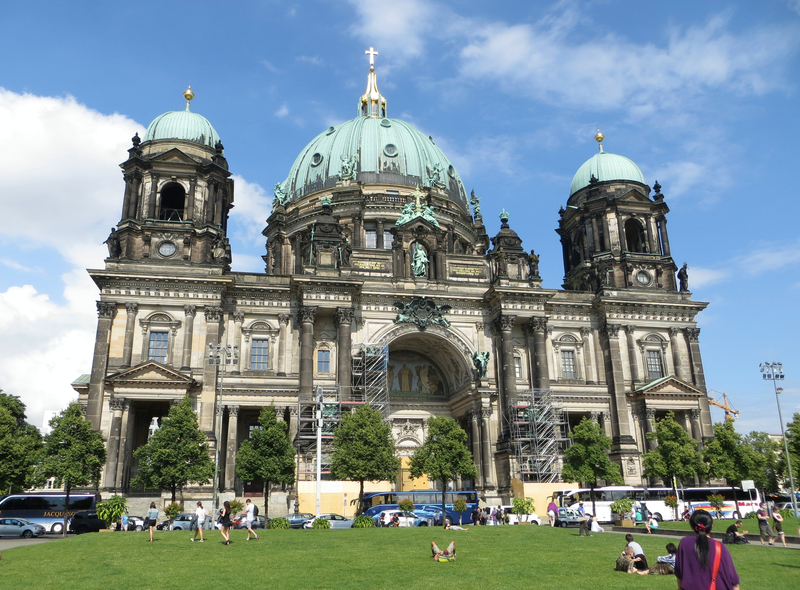 The Berlin Cathedral in all it’s glory. We climbed to the top for some great views. And yes, that’s a tiny speck of me “reading” in the grass afterwards. 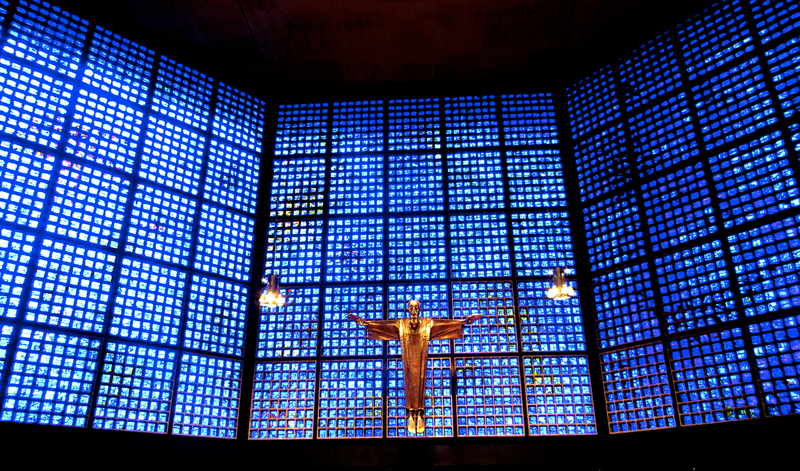 I wasn’t crazy about the exterior of the new church but the interior was pretty stunning. 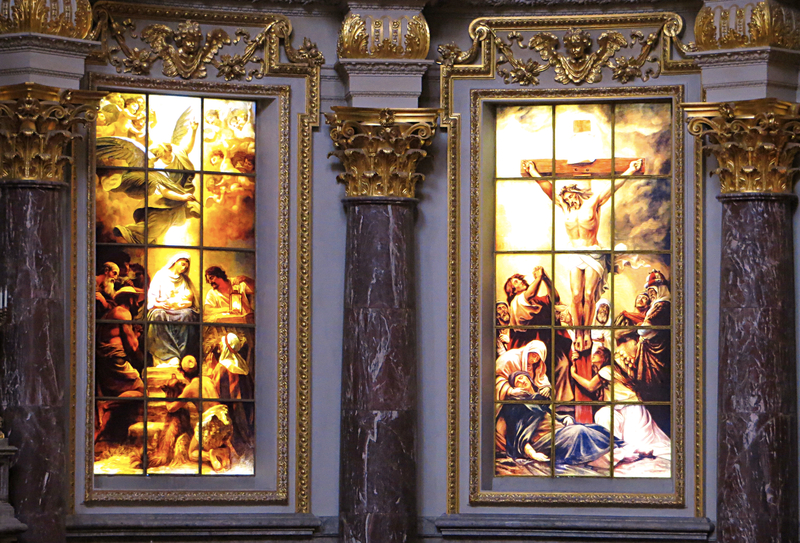 The Jesus figure was a modern take on the ancient subject, and we were able to enjoy a choir practicing while enjoying the view. 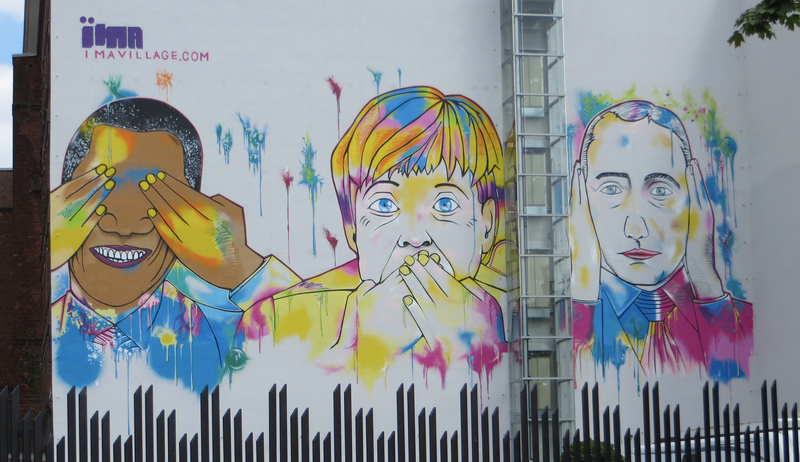 Berlin graffiti. Not at all sure what Obama, Merkel, and Putin have in common, but it was amusing.